Author's note: While both Venezuela and Guyana (the country) are in conflict with their respective native groups, this report will focus more on the Venezuelan side of the border. As such, "Guyana" will refer to the region, not the specific country, unless otherwise speficied within the text. In the country of Venezuela, gold mining is only possible in the Guyana region, which lies to the south of the Orinoco River. Like the rest of the Amazon river basin, the Guyana area has unique biodiversity characteristics whose preservation is vital and where human intervention must be measured against the highest standards in order not to upset the balance of this the greatest example of natural complexity in the world and which makes Venezuela the fourth country in the world with regard to bio diversity. Guyana is made up of 44% of Venezuelan territory but with only 5.5% of its population, which is mainly concentrated in a small area near Orinocco. The rest of the Guyana area has remained relatively free from the predatory intervention of the State and capitalism. The mining potential of Guyana (gold, diamonds, bauxite, iron, radioactive materials, titanium etc.) has been known about and exploited for some time but the areas where these activities have taken place, the methods used to pursue them and their impact on the ecosystem has scarcely affected this vast area (although the environmental disasters caused by small mines, state technocrats and landowners has already caused some damage in certain areas). In Progress (1985 - now) This conflict over mining in lands claimed by native groups has been a continual problem since the conquest by the Spaniards brought gold-seeking men into the forests of the tropics. The problem has become worse since the beginning of the 1980s, when prospecting groups projected that the Guyana area could contain the legendary "El Dorado" mother lode, between 8 and 12 thousand tons of gold. c. State: The Country of Venezuela, particularly in the states of Bolivar and Amazon. There is specific environmental and health damage caused by hydraulic mining, which involves blasting soil with powerful jets of water to clear the soil from the rocks underneath. When hydraulic mining is done away from the rivers (which are often the source of the water the miners use), it leaves huge pools of still water that become breeding grounds for malaria-carrying mosquitoes. When hydraulic mining is done along the riverbanks, it increases sedimentation in the rivers, which destroys fish breeding habitat and plant life along the edges of the rivers. A side effect of sedimentation which will affect more than just the local groups is the gradual silting up of hydroelectric dams on the major rivers, which disrupts power supplies and can eventually cause damage to the turbines themselves. The pollution caused by large-scale gold mining affects all aspects of the Guyana region, and the most immediately noticeable effect will be on the rivers. These include the Caroni River, which supplies drinking water for 80 percent of Bolivar. The upper Caroni basin feeds the Guri Dam, source of 72 percent of the country's electrical power. And many Indian tribes depend on the streams and rivers that connect with the Caroni for fishing and drinking water. Articles critical of the Venezuelan government's stance on opening the area to greater mining activity say gold mining has already seriously damaged the main waterways in the region. Analyses by the Venezuelan National Guard show high levels of mercury contamination in the Caroni, and more than half the people living near the lower Caroni basin were contaminated by mercury. The state of Bolivar has the country's highest incidence of children born with Down syndrome and other birth defects, the Venezuelan Mining Chamber says. In Ciudad Guyana, in Bolivar state, locals avoid the fish, once a staple of their diets, for fear of mercury poisoning. In addition to birth defects, mercury poisoning causes neurological damage, with symptoms ranging from muscular atrophy to mental deterioration. Mercury can be absorbed into the body through the skin as well as through ingestion, which means that simple personal hygiene is a major health risk for the poorer people in the area. Bathing in the river is not advisable, but many of the local Indians have no other resources for mass quantities of water. Both the site of the harm and the site of the act are the same: the Guyana area of Venezuela. The multinational corporations claim to be promoting a more rational and ecologically sound exploitation of the area's resources than the wildcat miners. The contradiction of fact with statement is that the multinationals are also using open-pit mining without sophisticated anti-pollution equipment. According to the World Resource Institute, an international watch-dog group, there has been no previous experience of an open cast mining system in tropical areas where its introduction has not produced irreparable damage to the local ecosystem. The technology that will be used by Cristalex, Yellow Jack, Monarch or Placer Dome is the same which is used outside the tropics. This author was also unable to find any scientific work published which would substantiate the claims of the mining companies about their "ecologically sound" practices, however, it should be noted that many of the documents criticizing the mining companies were not produced by scientific groups either. Miners continue to work in areas where they have historically operated, which are now areas under contract by the Venezuelan government to multinational mining companies. Wildcat mining is not always done by outsiders to the indigenous areas, but also by locals themselves. This type of mining provides a livelihood for 42% of the economically active population within the general area, and for 65% and 45% of the Santo Domingo and Ciudad Dorada workforces respectively (Placer Dome, Inc. statistics). 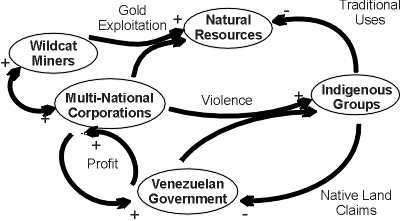 The profit flow among the Venezuelan government, the wildcat miners and the multinational corporations pushes the three of them to promote exploitation of the Guyana natural resources. The local indigenous groups have continued to make claims against the government, trying to stop the influx of miners, both legal and illegal. The multinational corporations and the Venezuelan government have responded to indigenous protest groups with violence, especially against those groups which are working to actively block miners from tribal areas. The number of casualties in this dispute has been very high, but has gone mostly unreported because the losses are mostly on the side of the indigenous people. Both violence and pollution-related deseases have taken a toll on the local populations. Human Rights protest petitions have put the number at 13,000 dead from direct and indirect interaction with the mining groups. The actors in this case are 1) the Venezuelan government, including its military, 2) multinational mining corporations, 3) "wildcat" miners, and 4)the indigenous peoples of the Guyana region. The prevention of both the conflict and the pollution caused by these mining operations coulld be done by recognizing the rights of the indigenous peoples to their traditional homelands and removing the multinational corporations. While there are some Venezuelan laws which set aside lands for the local tribes, the laws are not enforced and the government does not pursue any reports of tresspassing or resource extraction in those areas. The money which the Venezuela government is earning from the international contracts makes it very hard for the government to justify removal of the mining companies in the eyes of the general public. The government has found it easier to remove the indigenous groups from the mining areas - through force, if necessary - than to remove the miners. The environmental hazards posed by mining operations could be lessened by using the contract fees to establish strong inspection teams with wide-ranging authority to close down mining operations which pollute the Guyana area. These teams would have to be backed up by strong environmental legislation from the Venezuelan government. The tensions between the miners and the local people might also be lessened if the government were to include the locals in all aspects of the mining contract process, including location permits and environmental inspection teams. Bertram, Marshall. The Birth of Anglo-American Friendship: The Prime Facet of the Venezuelan Boundary Dispute. Lanham Md. : University Press of America, Inc. 1992. Braveboy-Wagner, Jacqueline Anne. The Venezuela-Guyana Border Dispute: Britains Colonial Legacy in Latin America. Boulder: Westview Press. 1984. Brooke, James. "Panning for Gold in Venezuela" New York Times, July 11, 1995. Forest Peoples Programme Guyana: Indigenous People Complain to Government about Multinational Miners and Loggers. June 30, 1997. McNair Paper Number 53, Chapter 1, October 1996. National Defense University, University of Miami. Schemo, Diana Jean. "Legally Now, Venezuelans to Mine Fragile Lands." New York Times, Dec.7, 1996. Venezuelan Review: Embassy of Venezuela, July 1997.